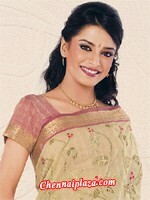 Lady's Fashion > Sarees > Cotton Silk Special 2009. Item Description Marvellous looking cotton silk saree having self designer floral pattern interspersed all over turquoise blue colour body is complimented by a paisley designer zari work in geometric pattern on a contrast pink colour pallu and border. Item Description Fabulous looking cotton silk saree having self stripes designer pattern interspersed all over light brown colour body is complimented by kalamkari work on paisley designer zari work in a contrast cream colour pallu and border. Item Description Lovely looking cotton silk saree having self stripes and buttis designer pattern interspersed all over grey colour body is complimented by beautiful kalamkari work on paisley designer zari work in a contrast off white colour pallu and border. Item Description Lovely looking beige/pink contrast colours combination based cotton silk saree having self stripes designer thread work decorated with contrast colours creeper and floral designer resham thread embroidery work decoration interspersed all over beige colour body complimented by a marvellous reddish brown colour pallu and border having lavish intricate floral and geometric designer zari work decoration.